The CD31 antigen, also known as Platelet Endothelial Cell Adhesion Molecule 1 (PECAM-1), is a transmembrane glycoprotein of 130 kDa related to the immunoglobulin superfamily. Its expression has been shown on stem cells of the myeloid lineage, on platelets and on endothelial cell junctions. CD31 has been demonstrated to bind in a homophilic manner (CD31 binds CD31 on opposing cells). It also mediates heterophilic interactions, in particular, CD31 is involved in the migration of leucocytes through the endothelial cell wall, via adhesion to αvβ3 integrin and to CD38. 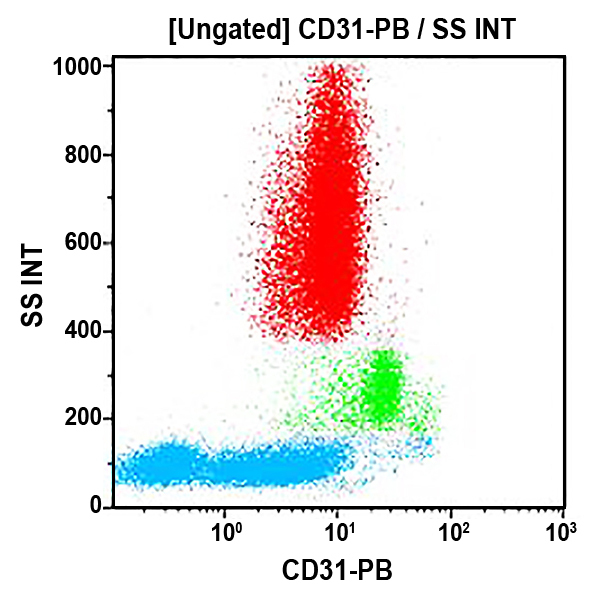 In addition, CD31 participates in outside-in signaling in leucocytes likely through phosphorylation of its intracytoplasmic tyrosine residues 663 and 686 and subsequent association with tyrosine phosphatases SHP-1 and SHP-2. Studies suggest a comparable mechanism of action for CD31 in activation and aggregation of platelets. *Alexa Fluor and Pacific Blue are registered trademarks of Molecular Probes, Inc.